As action rpgs started to gain in popularity during the 16-bit era, many game companies began cashing in on this new trend. Some were good, and some not so good. Enix had already created a hit with their action rpg Soul Blazer and it seemed only natural for the other big gun in the rpg world to follow suit. Enter Secret of Mana. A combination of the epic square storylines coupled together with this suddenly popular action-style combat. The result was a stunningly original and action-packed role-playing title for the ages and a game that's become one of the most beloved action rpgs ever created. 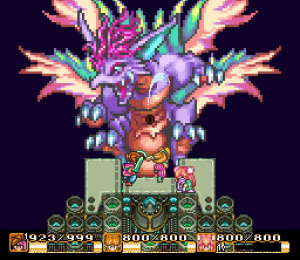 Up until the time Secret of Mana was released, the majority of Square's rpgs featured turn-based style combat. While Secret of Mana represented a new direction for Square, they pulled it off surprisingly well. You basically have several different types of weapons ranging from swords to spears. When you swing your weapon it hits at full strength if it's fully charged up. Once you've swung it, it has to charge back up to 100%. If you swing before it's fully charged your hit won't inflict as much damage. This aspect of the combat system makes the game more strategic. You can't just go into this one hacking and slashing. This strategy will especially come into play when you begin taking on some of the game's stronger enemies and bosses. The game also utilizes a new "ring" system. From here you can quickly and easily select items, equip weapons, and even configure the game's setting to your liking all with one push of a button. The game also sports a very unique multi-player function so two other players can get in on the action. This was an almost unheard of feature for an rpg at the time and still remains one of Secret of Mana's most popular features among rpg fans. 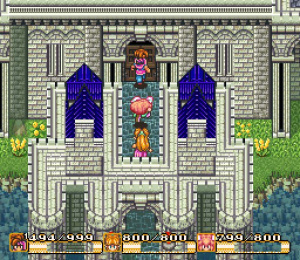 Visually Secret of Mana has a very unique look to it. 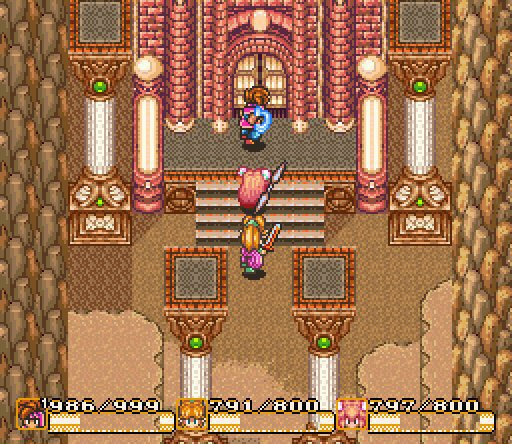 The game makes use of wildly vibrant color schemes throughout and the level of detail in the many various areas of the game are impressive, even by 16-bit standards. Of course as with many Super Nintendo games, there's plenty of Mode-7 special effects thrown in for good measure. The characters and enemies in the game are all very well-animated and show a lot of detail given the type of game. 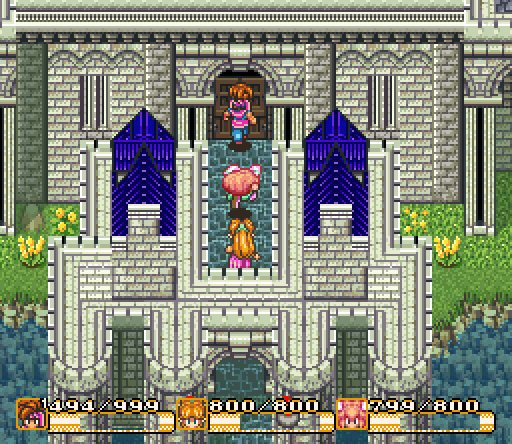 Secret of Mana is easily one of the more visually impressive rpgs of the 16-bit era and still holds up quite well, even all these years later. Square was already well-known for their musical prowess when it came to rpg soundtracks. Their Final Fantasy titles set new standards for audio in role-playing games and that standard would continue on in Secret of Mana. To say that the musical effort in Mana is epic would be an understatement. There are tons of musical tracks strung throughout the game and not a bad song in the bunch. There is also a wide range between the different tunes that always seems to fit the current situation perfectly. 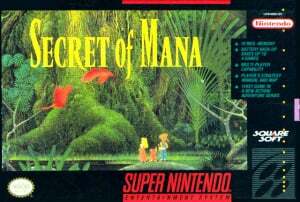 The Mana series would later go on to feature some amazing soundtracks in later years, but none quite as impressive as the one found in Secret of Mana. Although the storyline isn't quite as epic as Square's Final Fantasy series of games, it still offers a fairly long and engaging quest that should keep rpg fans busy for awhile. 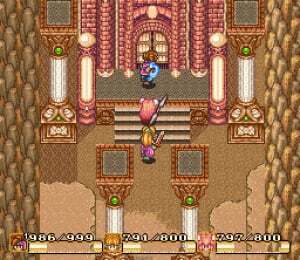 Secret of Mana manages to take the action-rpg stylings of Legend of Zelda, and add that trademark Square feel to it. Even though this is an action-rpg, it somehow manages to feel a little like a standard rpg due to the increased strategetic elements that are carefully injected into the game. The action combat stylings of this game may take some gamers a little time to get used to, but in the end what you're left with is a great action-rpg that will leave you feeling quite satisfied when you've finished it. If you're an rpg fan, you absolutely don't want to miss this one. Really hard for me to get into this game after playing a game like Ys. While Ys sped up the battles and made grinding incredibly bearable, Secret of Mana's Hack 'n' Wait, Slash 'n' Wait system makes the battles painfully slow and drawn out, and without a charming story and gameworld (like say, its semi-sequel, Secret of Evermore), there really wasn't anything to keep me coming back to this game, except perhaps the soundtrack. Oh, and I almost forgot about how annoyingly retarded your partners are if you don't have anyone else to play it with, although I guess considering the fact that it's 15 years old, and even modern RPG's have incredibly retarded teammates, I suppose it can be forgiven, this time. I'd give it a (blasphemous!) 7.5/10 myself, although I never made it quite to the end of it after owning it for years. This game is so overrated!! The gameplay is a bit simple. The magic attacks aren't that cool! And the story is boring!! I give it about a 7! I have to agree with everything Mickeymac said. I'm gonna keep playing it though, maybe I'll grow to like it better. If you like an RPG with an awesome story (yes, this has an awesome story. I don't care what these people say, the story effects your emotions, and you feel like you are actually in the game.) and an awesome battle system and a multiplayer feature, then go the wii shop and down load this RIGHT NOW! It is amazing. Nothing, not even the new 3D RPGs now, will ever beat this. Well, they could, but that won't happen. EDIT (11/21/09) : I actually played this game before I played any of the Final Fantasy games, and after playing Final Fantasy VI, I have a few adjustments to make to my comment. I agree that the story and the characters aren't as developed as Final Fantasy VI. It doesn't have an epic feeling like FF does. I still think the game is good though, and has some elements that are better than FF. I really like how they did the battle system. There are a million ways that an action RPG battle system could have gone wrong, but this isn't any of those things. For one thing, the difficulty of the battles aren't easy at all. I found myself having to level up in the forest for a while a certain parts of the game (the difficulty isn't all that hard, I just really lack any skill in gaming). Most action RPGs are modern 3D games, but they have difficulties that make them way too easy. Secret of Mana is among the classic games that provide a challenge for the player. There are many other reasons why I would give this a high score. Overall, this game deserves a 9/10 in my opinion. Easily one of the biggest time wasters in video game history. After reading about how much people liked it I decided to download it and give it a spin. Tedious huge worlds, uninspiring music, horrible CPU allys (especially when they get stuck running into a corner/wall/bush). About 20 hours of boredom later I'm still wondering "oookay... When does the game get good??" P.S. I would definately give this game a 4 out of 10. I thought this game was really good! It made you feel like you were part of something special! And the boss battles were definitely the best parts, especially Thanatos and the Mana Beast XD I think the music is jsut ok, but the intro music is gorgeous, and the Meridian Dance is just classic, as well as the Thanatos' theme with the Lich! That's my first RPG !!! I like that game. If you're reading this review, you should already own this game on VC! All the comments here are valid: the story isn't that great, there are no real puzzles, the combat can be tedious and the AI isn't fantastic. And yet I'd still say it's my favourite videogame of all time. The music is sumptuous, only recently rivalled by Xenoblade Chronicles. The individual characters are quite endearing, especially the cheeky Sprite. But the thing that sets it apart? Multiplayer. My best friend and I played through the whole game over the summer of 1995 together from start to finish and it was one of the greatest gaming experiences of my life. FFVI might have told a better story but it was strictly a solo affair. Mana gave us a unique shared experience. Even now we get the old SNES out and have a blast through every few years.